Reverend Monsignor Louis A. Marucci, D.Min was born in Philadelphia, PA. He grew up in Gibbstown, NJ and was educated at St. Michael Elementary School and St. James High School in Carney's Point, NJ. He attended Christ the King Seminary in East Aurora, New York and was ordained on May 23, 1987. He was named a Chaplain of His Holiness by Pope John Paul II on March 18, 2000 and given the Title Reverend Monsignor. Monsignor Marucci holds four Masters Degrees and the Doctorate of Ministry. He received a Master of Divinity Degree from Christ the King Seminary in East Aurora, NY, the Master of Arts Degree in Medical Moral Theology from St. Charles Borromeo Seminary in Wynnewood, PA, the Master of Arts Degree in Philantropy and Development from The University of St. Mary in Winona, Minnesota and the Master of Science Degree in Church Management from Villanova University in Villanova, PA. In addition, he earned the Doctor of Ministry Degree (Specializing in Medical Moral - End of Life Issues) from The University of St. Thomas in St. Paul, Minnesota. Monsignor holds the Vatican Diploma for Catechesis and a Certification in Catholic Social Teaching in addition to the Certification in Planned Giving. His areas of specialization are in the fields of Medical Moral Theology, Organizational Leadership, Strategic Planning, Operational Administration, and Philanthropy & Development. He was appointed Pastor of St. Andrew the Apostle parish on June 14, 2010. Despite his paralysis, consequential to his diagnosis of Multiple Sclerosis, (six months after he was ordained), he sees every challenge as an opportunity. Monsignor Marucci loves to ski using adaptive equipment and has a passion for Music as a harpist. In addition to his Pastoral Ministry at St. Andrew the Apostle, he serves as a consultant to several non-profit organizations assisting in Strategic Planning and the incorporation of "Best Practices" to establish Comprehensive Development Initiatives. Father Michael August J. de Leon was born in Quezon City, Philippines. He is one of eight children. He grew up in Metro Manila. After High School, he entered the Alagad ni Maria (Disciples of Mary) Religious Community in the Philippines in 1992. He finished his AB degree in Philosophy at SVD Christ the King Mission Seminary in Quezon City, Philippines. He had his Theology degree at CICM Maryhill School of Theology, and Biblical Greek at Loyola School of Theology (Ateneo de Manila). 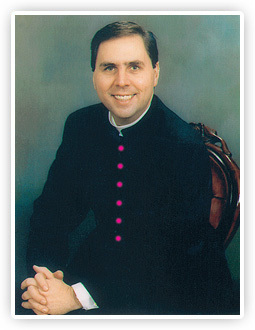 He was ordained to the Holy Order of Priesthood on the Solemnity of the Annunciation of the Lord on March 25, 2003. In the Philippines, he served as Pastor (parish priest) at Saint John the Baptist in Panukulan, Quezon (part of Polillo group of islands) from 2003 to 2007. He was a parochial vicar (associate pastor) of the Cathedral of the Infant Jesus and Saint Mark in the Prelature of Infanta, Quezon from 2007 to 2011. In both parishes, he worked with basic Christian Communities and engaged in different liturgical, youth, spiritual, social-justice and other ministries. In the United States, he was assigned as an Associate Pastor (parochial vicar) at Church of Saint Pius X in Scarsdale New York from 2011 to 2014. In 2012, he also took his Masters degree at Fordham University in New York. Currently, he is appointed as a Parochial Vicar at the Church of Saint Andrew the Apostle in Giibsboro, New Jersey. Deacon Bill Slaven was born in Camden, NJ and grew up in Gloucester Township, NJ. He attended Drexel University in Philadelphia, PA, where he received a Bachelor of Science Degree in Civil Engineering with specialization in Structrual Engineering. He is currently a Professional Engineer, licensed in 9 different states. Deacon Bill completed the Diaconate Formation Program of the Diocese of Camden in April of 2011. He was ordained a Permanant Deacon on May 21, 2011 and assigned to serve at our parish. He has been a member of St. Andrew's for over 25 years. He currently works with New Visions Homeless Day Shelter and is on the Board of Managers of Joseph's House, an all-night cafe for the homeless in the city of Camden.